We can provide a boat and driver to take you out for the day or half day from our base in Portree. Popular destinations include Raasay and Rona, and could include taking you for a meal, or dropping you off to explore and then picking you up later. The boat is coded for a maximum of 8 and so 7 passengers maximum can be taken on the boat. Recent and common sightings of wildlife include Dolphins, Seals, Sea Eagles, Golden Eagles, Otters, Gannets. Photography from the boat. Capture a more unusual view of our scenery. 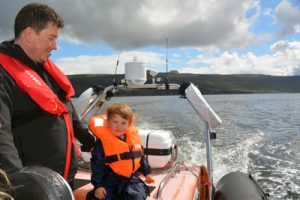 Family fun – charter the boat and a skipper to taxi you around the area, avoiding the Skye traffic! If you are interested in chartering/hiring the boat then please give us a call or drop us an email. Prices are variable dependent on where you want to go and for how long.